Regardless of what business are you in, everyone would love better insights into what visitors are doing on their site. It might be a blog, lead generation or e-commerce site, it doesn’t matter, they all are driven by one key measure, content. Content is why your users visit your site, stay on your site and return to your site. Whether you're adding new products, new services, new categories, new blog articles how do you know which of these content sections are worth your time and effort? Do you know exactly how each of your website sections performs? If the answer to these questions is a resounding no, then listen closely. Introducing Content Groupings to your Google Analytics account will provide you with a better and more importantly automated overview of your site. Content Groupings are very powerful in structuring and analysing your content performance in a smarter way and gives you key insights into content performance and optimisation tactics that are crucial for every website. By default Google Analytics shows you all the different pages that have received at least one-page view in the selected period. For larger sites with high traffic numbers breaking down the site into bite-sized pieces, you can analyse easier is a godsend. It makes it easy to discover blockages you want to remove, trends you want to enhance or decrease and even behaviour you never knew existed. Google Analytics offers a couple of ways to set up your content groupings.One way to do it is via the Google Analytics admin interface or via Google Tag Manager. The reason for so many options is to provide website owners to customise your groupings to suit your current website structure or CMS limitations. So read through all the options available and select the one that suited to your site. Note! Content groupings are effective only from the date of creation and do not apply retroactively. Using Google Analytics there are three different ways to set up content groupings, set up by tracking code, by extraction and by rule definition. The first step is to navigate to the admin interface in Google Analytics and click on content groupings. Once you have the code for each content section you will need to manually or dynamically set this up for each of your website content sections that you want to separate from each other. Adding this to the head tag along with your GA page view tag. This method doesn't depend on your website architecture, it is a suggested method if it cannot be based on directory/subfolders or you're using a subdomain for each section but sometimes this is the only option to structure the content groups in your desired way or you want an added measure of control. The second option is to work with extractions. You can define your content groups by page or page title (websites) or screen name (apps). If you know how to use regex (regular expressions) then this method is perfect for you, finding consistencies in URL structure to group together similar content. This method works well with an SEO friendly website structure that makes use of subfolders or a consistent website structure. You can define your content groups either by slug or by subfolder. In this case, there is a logical naming structure that allows you to easier group these pages in one Services Content Group or if you only want google analytics related services grouped you can do that too. The third option is ideal for novice users of Google Analytics who want to create these content groups by themselves. It is very similar to option two but more flexible to those who are not familiar with Regular Expressions. If you want to work with “negative” matches this grouping method is the way to go. Once again you can do the grouping by page or page title (websites) or screen name (apps). In addition, you can use statements as contains, starts with, ends with, but also does not contain, does not start with etc. The negative statements can be very useful in my experience. Sometimes you have defined all your content groups but a few pages are left. You can set up a match on does not contain your other pages and you are good to go. This method is very flexible and can cover sites with a poor structure but may also need adjustments to page title consistency if needed. Google tag manager allows you automation but also extreme flexibility by giving you the option grouping data by page title, URL and additional data layer variables. 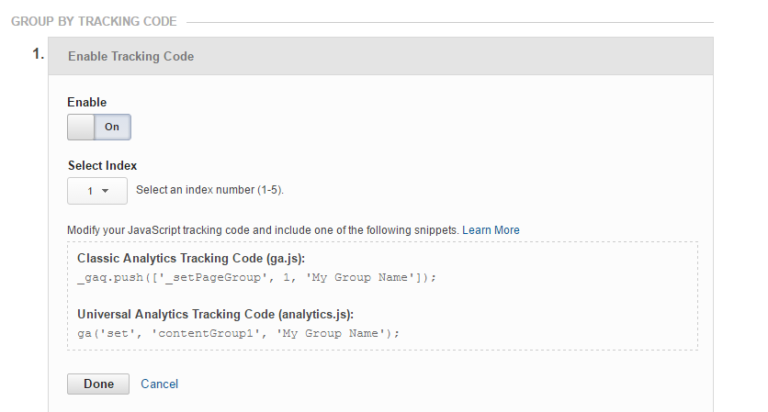 First, you will need to create a new content grouping in your Google Analytics account as in step one. Now that you're ready to group your site's content, what kind of content groupings do you think you would find useful for your site? Let us know in the comments section below.